On March 26, 2007, Quebec voters returned Jean Charest and the Quebec Liberal Party to power, albeit as a minority government (the first in Quebec in almost 130 years). Moreover, the election was a huge success for the upstart Action démocratique du Québec, under Mario Dumont, who won 41 seats and attained the status of Official Opposition (prior to the election, the Party only had four seats). The fall to third party status for the Parti Québécois, led by André Boisclair, creates a question mark for the longterm future of the Party and its goal of Quebec sovereignty. This article provides an overview of the 2007 general election, with discussions of voter regulations, Quebec electoral history, key political parties, and election issues and results. The last Quebec general election was held in 2003, in which the Quebec Liberal Party, helmed by Jean Charest won a majority government. The Liberals defeated the incumbent Parti Québécois, which had governed the province since 1994. Key issues in that election included health care waiting lists and voter desire for political change. Since the general election in 2003, several by-elections have been held in the Province, which have impacted party standings in the National Assembly. The Liberals lost two seats through by-elections, while both the Parti Québécois (PQ) and the Action démocratique du Québec (ADQ) picked up a seat. Other events since the 2003 general election have also impacted party standings in the National Assembly. In November 2006, Parti Québécois member Jean-Pierre Charbonneau resigned his seat in the riding of Borduas. That same month, Liberal member Diane Legault resigned her seat in the riding of Chambly. No by-election was held for either riding. Additionally, MNA Daniel Bouchard was forced to leave the Liberal Party and sit as an Independent after being charged with fraud. When the election was called, in February 2007, the standings of each party in the National Assembly were as follows. In November 2005, the Parti Québécois, the main sovereignist and social democratic party in Quebec, held a leadership convention to replace former leader Bernard Landry. Landry stepped down from the post after receiving 76.2 percent approval in a party leadership review, stating he felt he did not have enough support to continue as party leader. The subsequent leadership convention was won by André Boisclair, a former Parti Québécois Member of the National Assembly. Boisclair won the leadership on the first ballot, easily out-pacing other major rivals. The Quebec Liberal Party, which has not been associated with the federal Liberal Party since 1955, offers a blend of social progressivism (as opposed to social conservatism) and pro-federalism on the issue of Quebec’s place in Canada. Traditionally, the Party has supported a role for the state in managing the economy and encouraging economic development. In recent years, however, the Party has moved slightly more to the right on economic policy, advocating a smaller role for government in an attempt to address the Province’s substantial public debt. Jean Charest is the current leader of the Liberal Party. He has led the Party since 1998, and has been Premier of Quebec since 2003. Previously, Charest was active in federal politics with the former Progressive Conservative Party of Canada. He served as a Cabinet minister, under the Conservative governments of both Brian Mulroney and Kim Campbell. He also led the PC Party for a number of years, from 1993 to 1998. In the 2007 general election, the Quebec Liberal Party is campaigning on the issues of fiscal conservatism and bringing the government’s finances under control. The Party’s plan includes a focus on health and education spending and reducing levels of taxation in Quebec, while limiting government spending in other areas. The Party has also focused on environmental policy, promoting French culture, and continuing to improve Quebec’s political power within the Canadian federation. The Parti Québécois is a left-wing political party that advocates national sovereignty for Quebec and the Province’s secession from Canada. Since its creation in 1968, the Party has been at the fore of the Quebec secession movement. While in power, the Party initiated two provincial referenda on the issue, in 1980, and again in 1995. On economic and social policy, the Party has traditionally been to the left of the political spectrum, advocating a strong role for the state in economic development and addressing social and cultural issues. André Boisclair is the current leader of the Parti Québécois. He joined the Party in 1984, was first elected to the National Assembly in 1989, and has served as a Cabinet minister in two PQ governments, those helmed by Lucien Bouchard and Bernard Landry. In 2004, Boisclair left politics to complete a Masters in Public Administration at Harvard University. In 2005, he returned to Quebec politics, successfully winning the Party’s leadership following the resignation of former leader Bernard Landry. In the 2007 general election, the Parti Québécois is campaigning on several key issues, including national sovereignty, increased spending in the areas of education, health and the environment, as well as controlling government waste through a proposed reorganization of the public service. The Action démocratique du Québec is a right-of-centre political party that advocates fiscal conservatism and a lesser role for government in economic and social policy. On the issue of sovereignty, the Action démocratique du Québec supports Quebec autonomy within the Canadian nation-state, rather than full separation. The Party, while never forming government, has enjoyed limited electoral success; it had five members in the National Assembly prior to its dissolution for the 2007 election. Mario Dumont is the leader of the Action démocratique du Québec, and has been since the early years of the Party in 1994. Dumont first entered in politics in 1986, as a member of the youth commission of the Quebec Liberal Party. In 1994, following a split with the Liberal Party on the Charlottetown Accord, he left, helping to form the new party, and later becoming its leader. He was first elected to the National Assembly in 1994 for the riding of Rivière-du-Loup. In the 2007 general election, the Action démocratique du Québec is campaigning on a range of issues, including balancing the budget, reducing government debt, reducing government regulation of the economy, Constitutional renegotiation with Canada, increasing spending in education, offer direct financial assistance to parents for child care (as opposed to the current system of providing subsidized child care centres). One of the key issues in this election is whether Quebecers wish to give Premier Jean Charest and the Liberals a second mandate in government. The Liberal’s first mandate has been rocky at best. After enjoying strong success in the 2003 election, Charest’s Liberal government pursued broad reforms of social programs, as well as cuts to government spending and the civil service. Midway through their mandate, the Liberals faced prolonged labour unrest due to their “streamlining” of the civil service, resulting in a sharp drop in popularity with Quebec voters (falling well behind the opposition Parti Québécois). By 2006-07, support for Charest’s Liberals had rebounded; the Party entered the 2007 general election campaign slightly ahead of the Parti Québécois in the polls. An ever-present issue in Quebec provincial politics is national sovereignty. Charest’s Liberals have attempted to frame the election on the issue, warning that a vote for the Parti Québécois is a vote for another referendum on sovereignty. Recent polls have indicated that two-thirds of Quebecers do not want another referendum. The Parti Québécois has downplayed its traditional position, despite the fact that after being elected leader of the Party, André Boisclair vowed to hold another referendum on Quebec sovereignty. When the PQ released its 2007 election platform, however, the word ‘referendum’ was absent. The Party instead promised a “public consultation” on the issue. The Action démocratique du Québec, by contrast, has accused both the Liberals and the Parti Québécois of fixating on the issue of a referendum instead of focusing on new ideas to improve the lives of Quebecers. Another election issue involves perceptions over a fiscal ‘imbalance’ in the Canadian federal system. All parties have taken the position that Quebec deserves a larger share of federal-provincial revenues. Charest’s Liberals have been aided on this issue by recent agreements with the federal government to increase fiscal transfers to Quebec under the national Equalization Program. There is also an expectation that the next federal budget, due in March 2007, will offer more money to Quebec. The Parti Québécois, however, has argued the Liberals have failed to properly address this issue, and that sovereignty is the only true solution for overcoming fiscal conflicts between the province and the federal government. The Action démocratique du Québec has argued for an “in house” solution to the alleged fiscal imbalance; for them, Quebec should pursue a policy of fiscal autonomy or independence from federal transfers by controlling government spending, eliminating the debt, and growing the economy. Health care policy, in particular, overcrowding in hospital emergency wards, could also prove to be a key election issue. 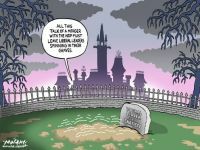 Charest’s Liberals have promised to fix the problem, if elected to serve a second mandate. The Quebec Liberal Party plan includes hiring 1,500 new doctors and 2,000 new nurses to reduce overcrowding. The Party has also publicly blamed the Parti Québécois for the current situation, arguing that the PQs decision to offer early retirement to doctors and nurses in the 1990s has resulted in a personnel shortage. The Parti Québécois have countered by pointing out that the Liberals promised to address overcrowding in the 2003 election, and have failed to achieve any results four years later. The Party has also pledged to increase the number of health care professionals, as well as increase overall government spending in health care. The Action démocratique du Québec, by contrast, has advocated the development of a mixed health care system (public, private, cooperative) in order to deal with current stresses on the public system. The results of the 2007 Quebec election were significant for a number of reasons. Firstly, while the Liberals, helmed by Jean Charest, were returned to power, they were only able to win a minority government. The Liberals dropped 28 seats and over 12 percent of the popular vote from the 2003 general election. This minority government status means the Liberals will have to seek support from the other parties in the National Assembly in order to pass legislation and govern effectively. On a historical note, this is the first minority government in Quebec in almost 130 years - the last occurred in 1878. Secondly, the election represented a huge success for the Action démocratique du Québec. While the party did not win government, it increased its seat total tenfold, from four seats prior to the election to 41 seats. Moreover, the Action démocratique du Québec became the Official Opposition, pushing the Parti Québécois into third place status. At a minimum, the success of the Action démocratique du Québec indicates the emergence of a strong three party political system in Quebec, which has traditionally been only a two party system with the Liberals and the Parti Québécois. Finally, the election held mixed signals for the Parti Québécois. On the one hand, the fall to third party status was a major set back (typically the Party either forms government or is the Official Opposition). However, the Party only lost dropped nine seats and less than five percent of the popular vote from the 2003 general election - far less than the drop experienced by Quebec Liberal Party. As such, it is not clear precisely what this election will entail for the longterm fortunes of the Parti Québécois and its goal of Quebec sovereignty.